On the morning of 28 November 1979, Air New Zealand Flight TE901 left Mangere airport, Auckland, for an 11-hour return sightseeing flight to Antarctica. 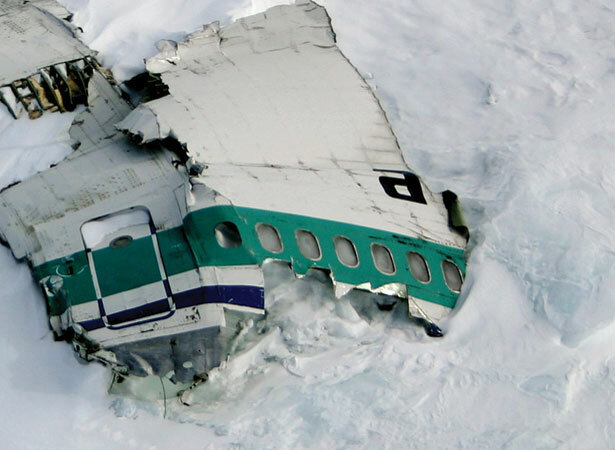 At 12.49 p.m. (New Zealand Standard Time), the aircraft crashed into the lower slopes of Mt Erebus killing all 257 passengers and crew. It was the worst civil disaster in New Zealand’s history. Air New Zealand had begun operating one-day sightseeing flights to Antarctica in 1977. Leaving Auckland, the aircraft headed for Antarctica, where passengers enjoyed low-level views of the Ross Dependency before returning, via Christchurch. The flights had always operated smoothly and were popular with adventurous Kiwis and tourists. When TE901 failed to arrive at Christchurch on schedule, authorities feared the worst. It was clear that the plane, if still airborne, would soon run out of fuel. Search and rescue operations began in Antarctica but it was not until midnight (NZST) that aircraft spotted wreckage on the lower slopes of Mt Erebus. Final confirmation that there were no survivors came later the next day. More than 60 professionals and volunteers were involved in the gruelling tasks of recovering bodies from the crevasse-riven site and inspecting the wreckage to determine the cause of the disaster. These operations took several weeks. Against heavy odds, they retrieved all the bodies and eventually 214 were identified. An air accident investigation began, using information from the aircraft’s flight recorders and other sources. Debate raged over who was at fault for the accident. The chief inspector of air accidents attributed the disaster to pilot error. Justice Peter Mahon’s Royal Commission of Inquiry disagreed, placing the blame on Air New Zealand and its systems. Today, the argument over what really caused the Erebus crash continues. There were clearly a number of contributing factors. But which of them was the most significant, and whether the pilots or the airline were ultimately responsible, remains a matter of intense debate. The Erebus disaster has been remembered in many ways. Memorial services for the victims were held in the immediate aftermath of the crash, and have continued, notably on significant anniversaries. We have 9 biographies, 10 articles, related to 257 killed in Mt Erebus disaster.